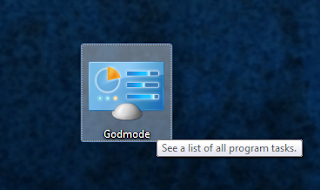 May be Sometimes it get quit difficult to Explore a particular search option as some of the setting options are hidden in windows 7 or in windows 8 and even many times it becomes hassle to search a particular option in your own P.C./laptop and that limited options irritate us and in that Case GODMODE helps you. What is God Mode ? God Mode simply explore all the options of administrative setting or allow you to access all controls or setting in just one Folder. 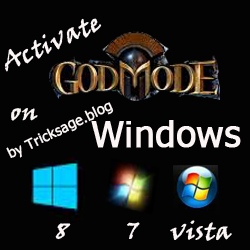 And ya its not a Software or a plugin it just a simple Trick provided by Tricksage.blog and To activate GOD Mode in your's or any PC follow the below given simple tutorial. Make a new folder any where in Desktop (by Right click on desktop and select new folder option). Now Simply Rename the Folder with the below Given code. The folder icon will change to a logo Similar to Control panels logo(shown below in pic). Now just open that folder by clicking on folder and you will see the whole controls/setting options. So,,by this shortcut anytime you can change or controls your computer settings rather than go to the control panel and search all bunch and then select your options.